A double album filled with witty , crispy and profound music . Moreover, this version of the Kammermusik is one of the best available. A colleague and friend of mine calls the Royal Concertgebouw Orchestra a Rolls Royce. 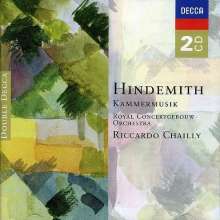 Riccardo Chailly must have driven one on this album. Do not miss this !